Some things are so much fun it just makes one smile to even know about them. 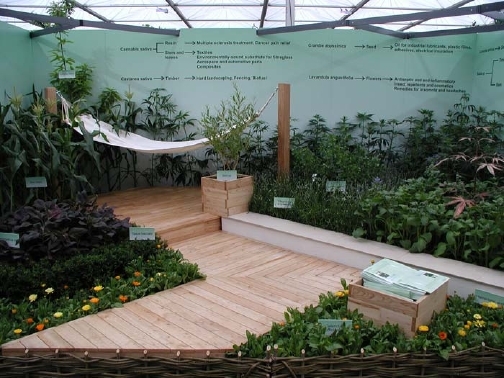 An excellent example is the South East England Development Agency (SEEDA) Garden at The Royal Horticultural Society Chelsea Flower Show. The SEEDA Garden features plants with industrial uses as part of the Lifelong Learning exhibits at the sold out show running this week. Yes, your eyes do not deceive you – that's Industrial Cannabis growing at the back of the display. SEEDA is the Government-funded agency responsible for the sustainable economic development and regeneration of the south east of England. Their hard work, which included getting a special government permit for the Cannabis plants, was rewarded by a Gold Medal. No, unlike the rest of the plants at the show they will not be part of the end of show public plant sale. Hemp farming legislation is once again at the top of the news. The California Assembly has passed AB 684 by a vote of 41 to 29 (with 9 members not voting). The bill now heads to the Senate. It is reported that Governor Schwarzenegger has not yet taken a position on the measure. If you are from California, please remember to write your Senator and ask her or him to support AB 684 and hemp farming in California. Things did not fare so well for HB 424 in New Hampshire. Once again, the hemp farming bill there has been killed in the Senate. Overcoming law enforcement objections is key to getting hemp bills passed, but simply adding provisions to overcome these objections does not seem to be enough. We also need to overcome seventy years of misinformation and a lack of political will. Every failed bill is a learning experience, and with education to overcome ignorance and hope to overcome fear, New Hampshire will eventually pass a hemp bill. It has been said that hemp can be used to produce more than 25,000 products, and we see it being put to more and more uses every year. Products range from hemp-reinforced composite epoxy pallets to the latest food trend, hemp milk. (Saskatoon, SK) The Saskatchewan Flax Development Commission (SFDC) wants the world to know that we re ready to develop a fiber industry in Canada. SFDC has been selected to host the 2008 International Conference on Flax and Other Bast Plants, in Saskatoon, Saskatchewan on July 21 to 23, 2008. It will be the first time the event has ever been held in North America. Organizers are expecting scientists, producers and industry representatives from around the world to discuss agronomy, processing and end uses of flax, hemp and other fiber plants. We re excited to bring the world s top fiber experts to Saskatchewan, says Allen Kuhlmann, Chairman of the Saskatchewan Flax Development Commission, which represents almost 15,000 flax growers in the province. It offers a chance to showcase Canada while sharing cutting-edge research on the fiber trade, processing methods, biotechnology, and new applications for fiber products. The current and future potential for the natural fiber industries is significant textiles alone represent the fourth-largest sector in the world, says Dr. Ryszard Kozlowski, Director of the Institute for Natural Fibres in Poznan, Poland, and one of the international collaborators on the conference. The conference will include topics such as breeding initiatives in hemp and flax; nanotechnology applications; and green buildings made with natural fibers, as well as post-conference tours offering delegates the chance to see flax and hemp fields in the land of living skies. We ve launched a new website to communicate conference details with delegates here and in other parts of the world, says Kulmann. People are encouraged to visit http://www.flaxbast2008.com/. A Call For Papers also went out today fiber specialists around the world are encouraged to submit abstracts in their area of expertise. The conference is being coordinated by representatives across Canada with expertise in fiber, agriculture, research and industry development. Partnering with SFDC to host the event are the Saskatchewan Council for Community Development, Agriculture & Agri-Food Canada, National Research Council of Canada and the governments of Saskatchewan and Alberta. Hemp is not like pot. Please make a note of it. Thanks. Crossposted and Recommended diary at DailyKos. If hemp had remained an agricultural crop instead of being classed as a Schedule 1 drug we wouldn't have had all the problems we've had all these years. I just like to say that. I have been wanting to address the issue of comparing hemp to pot. This happens often and it is so stupid it drives me nuts to have to listen to it. John Walters, "Drug Czar" for the Bush Administration, the worst presidential administration in human history, has often found it useful to compare and contrast hemp and marijuana. Is he really stupid, or does he have an agenda? His purpose, of course, is to hold the Official Line, Reefer Madness. His job is to lie, to distort, to confuse, and to muddy the waters of public discourse. A typical Team Bush crony. "You have legitimate farmers who want to experiment with a new crop," Riley said. "But you have another group, very enthusiastic, who want to allow cultivation of hemp because they believe it will lead to a de facto legalization of marijuana." Mr. Riley continued with "The last thing law enforcement people need is for the cultivation of marijuana-looking plants to spread. Are we going to ask them to go through row by row, field by field, to distinguish between legal hemp and marijuana?" Um, no — you do what the Canadian government did. Hemp farming in Canada is well regulated by Health Canada ensuring that only legitimate farmers are licensed and that they only grow government approved low-THC hemp. Requirements include applicant background checks, GPS coordinates of hemp fields, the use of varieties of approved low-THC certified hemp seed purchased from licensed seed vendors, and random inspections and testing. This licensing scheme ensures that farmers are only growing non-drug industrial hemp and not marijuana. Even though law enforcement is able to distinguish the difference between hemp and marijuana, the licensing process eliminates the need for them to visually distinguish between industrial hemp and its drug psychoactive cousin. Industrial hemp plants have long and strong stalks, have few branches, have been bred for maximum production of fiber and/or seed, and grow up to 16 feet in height. They are planted in high densities of 100 to 300 plants per square yard. On the other hand, drug varieties of Cannabis are shorter, are not allowed to go to seed, and have been bred to maximize branching and thus leaves and flowers. They are planted much less densely to promote bushiness. The drug and non-drug varieties are harvested at different times, and planting densities look very different from the air. Don't believe me. Check this out. Here is a copy of the listing for Cannabis that was in the April 1927 USDA Farmers' Bulletin No. 663, "Drug Plants Under Cultivation." Later printings of Farmers' Bulletin No. 663 did not have it. From the section titled, "THE CULTIVATION AND HANDLING OF DRUG PLANTS", pp. 16-17. The U.S.D.A. teaching farmers how to grow seedless flowering tops of Cannabis, amazing. Compare that information to that in historical and modern hemp farming guides and you are now an expert in the subject. However, law enforcement is still living in their past and believe that the proposed DEA ban on hemp foods is current information and HIA v DEA never happened, and present testimony to committees fully believing their own rhetoric. They act like like the 1998 DEA press release "Statement from the Drug Enforcement Administration On the Industrial Use of Hemp" is gospel. They also seem to believe that the ONDCP National Drug Control Strategy statements on industrial hemp in 1999-2001 are just as valid today as when they were written. We know that they are not, but law enforcement does and they are more than willing to present such testimony to legislative committees as they just did in New Hampshire to kill the hemp farming bill there once again. "A license required by this section is not conditioned on or subject to review or approval by the United States drug enforcement agency." The language in version 78020.0500, page 7 lines 14-15, which is available on their legislature's Web site. HB 1020 passed the House 92-0 on April 24, 2007 and passed the Senate 47-0 on April 25, 2007 and was signed by Governor Hoeven on April 27, 2007. It it is now law as there was an emergency clause in the bill that was carried. Jordan Smith has a well written update in today's Austin Chronicle in her story North Dakota Hemp Heads Toward Federal Showdown. It will be interesting to see where things go from here. "The term 'marihuana' means all parts of the plant Cannabis sativa L. ... but shall not include the mature stalks of such plant, fiber produced from such stalks, oil or cake made from the seeds of such plant, any other compound, manufacture, salt, derivative, mixture, or preparation of such mature stalks (except the resin extracted therefrom), fiber, oil, or cake, or the sterilized seed of such plant which is incapable of germination." The language of the exemption was carried over almost verbatim to the definition of marihuana in the CSA [21 U.S.C. §802(16)] which superseded the 1937 Tax Act, but since there was no active hemp industry at the time the provisions for hemp farming were not included in the new Act. "2. This Convention shall not apply to the cultivation of the cannabis plant exclusively for industrial purposes (fibre and seed) or horticultural purposes." Laws allowing the farming of industrial hemp would not be in conflict with the Single Convention of which the U.S. is a signatory. The media is finally starting to get past the "giggle factor" that surrounds hemp. One of the best treatments of California's hemp farming bill, AB 684, was in a story by Samantha Young in yesterday's Fresno Bee titled State Assembly approves hemp farming bill. I'm starting to ramble. So, let's have a discussion about hemp farming & related stuff. If you want to discuss pot, please check out the diary Pot is not like tobacco. Please make a note of it. Thanks. by xxdr zombiexx. Weird, it has an eirily similar title to this one. Some weeks are like roller coasters. Last week was one of them. I started off by presenting testimony for Vote Hemp for HB 424 before the Senate Commerce, Labor and Consumer Protection Committee in New Hampshire on Tuesday. I have been to better, more positive hearings. The hearing for the hemp farming bill came just before lunch and committee members seemed hungry to get out of there. It followed a lengthy hearing for a health insurance bill. The room was way too warm. I had decided after the hearing in the House that I would try to speak after law enforcement if possible. I was successful, but the Committee did not take the opportunity to ask me more than one question. Major Susan Forey of the New Hampshire State Police and Associate Attorney General Ann Rice presented what I would generously call misinformation. Unfortunately I have heard the talking points that they were using in testimony in other states. These talking points are from a very old playbook, which we countered years ago in the Vote Hemp Treatise. Supporters of hemp farming in New Hampshire did not present their best testimony in favor of the bill. I would hope that the Committee can see through this and send HB 424 to the floor of the Senate for a vote before the end of the session. Things went much better in Vermont on Thursday and Friday. I presented testimony for Vote Hemp for H 267 before the House Committee on Agriculture. I was a few minutes late for my hearing time, but I was in contact with Amy Shollenberger of Rural Vermont who informed the Committee Chair of my arrival time. When I did arrive I knew I was in friendlier territory by the Hemp for Victory poster on the Committee's wall! North Dakota House Assistant Majority Leader David Monson was there, too, having already arrived in preparation for his testimony the next morning. My testimony went well and the Committee asked questions for well over an hour.